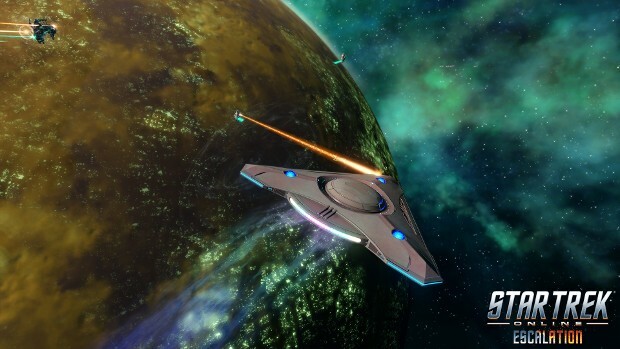 This week, Star Trek Online Season 13 launched on consoles continuing the saga of the Lukari as they joined the spacefaring races. Although a technologically advanced race capable of space travel, the Lukari had elected to remain at home on their own planet, seeing no reason to venture out into space… until their sun started to die. Now, the race finds itself lead off world by leader-turned-starship captain Kuumarke — voiced by Star Trek: Enterprise alum Kipleigh Brown. 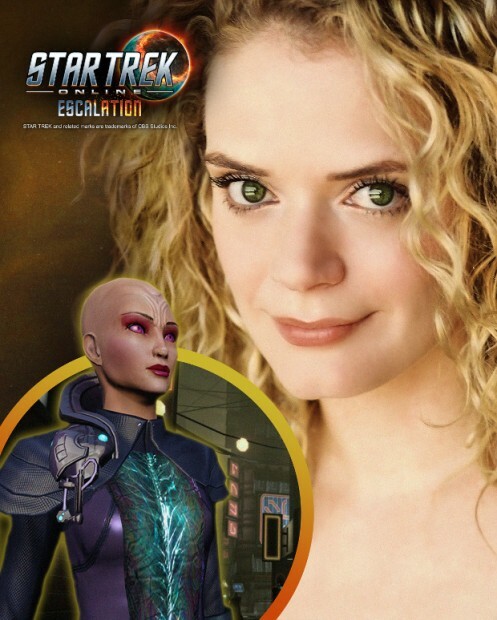 Recently, I was invited to sit down with Kipleigh to discuss her role in the game and chat about Star Trek in general. With both of us having grown up watching the show and loving science fiction, we got a little off topic here and there, reminiscing about Star Trek’s impact on society, the loss of Leonard Nimoy, and the importance of fan-made projects. Like most nerdy kids, appearing on Star Trek had been a long time dream for Kipleigh. And, as it turned out, this episode was a bigger treat due to it being directed by Levar Burton and being the episode that Seth MacFarlane happened to do an appearance on. From there, we went on to discuss Kipleigh’s role as Kuumarke in Star Trek Online. When asking about the character I flubbed the pronunciation and was immediately corrected. (You have to roll that ‘r’.) That said, being corrected led to a funny story about the voice direction for this particular character. If there was one thing that became evident as the interview progressed, it was just how fond Kipleigh is of Kuumarke. She describes the character, her race, and her story with so much love and passion. To her, Kuumarke is more than just a character she plays, she’s the embodiment of all things good. Kuumarke’s story in Star Trek Online begins when her people’s sun begins to die. As their leader, she takes on the roll of the race’s first starship captain and ventures into space, where she starts out a bit naive. She leaves her planet filled with wide eyed wonder and slowly learns that space can be a dangerous place. She even learns a bit about her own ancestors and the uses of protomatter — which her people have only ever used for good — as weapons. While she struggles with these kinds of ideas and is forced to grow up some, she somehow manages to not fall to cynicism. She does however — as Kipleigh says — go “from being timid to a badass hero”. She always believes in goodness and feels that “no race is expendable”. Listening to Kipleigh talk about Kuumarke, it’s hard not to get sucked in — even if you don’t play STO, or just haven’t played some of the more recent updates. The good news is, that if you’re interested enough in Kuumarke and want to spend some time with her, she functions as a bit of a player companion. She also comes in a bit earlier on than the most recent season, beginning in Season 10. So new players will be able to spend some time getting to know her. What’s also evident is that Kipleigh’s love doesn’t just extend to her character on Star Trek Online. Rather, she’s a true fan of the franchise. We both gushed a bit about Star Trek: The Original Series and Next Generation and the impact it had on our lives as well as the driving force it was for social commentary and change and how Star Trek has always functioned as a vision of hope for everyone. And it continues to — particularly via passionate fan projects. One such project is something that Kipleigh is deeply invested in: Star Trek Continues. This fan-based series continues the story of the original Enterprise, picking up where the series (not the Abrams universe) dropped off. It stars Vic Mignogna — a prolific anime voice actor who also fills the rolls of writer, producer, director, editor, and even composer on the series — as Captain James T. Kirk; as well as James Doohan’s son Christopher in his father’s role of Mr. Scott and Mythbuster’s alum Grant Imahara as Sulu. Kipleigh fills the roll of Lt.j.g Barbara Smith. As she describes the show, it’s a tribute to Roddenberry and the team tries to use production methods as close to those used in the original series as possible when working on the show. Even sets are recreated to detail — with the production team sometimes even getting their hands on original props or molds to work with. For fans of the original series, it’s about as spot on as you’re going to get without having the 1960’s cast. Before wrapping up the interview, Kipleigh dropped a bit of a surprise regarding the Star Trek Continues series. As it turns out, she’s not just acting in the next episode, she’s also the writer. Due to premiere July 27 at Flordia Supercon, the episode is titled “What Ships are For”. Unfortunately, she couldn’t offer much more information beyond that — other than the fact that there’s a special guest star that even shocked her. She reportedly screamed for about 20 minutes after finding out who it was. 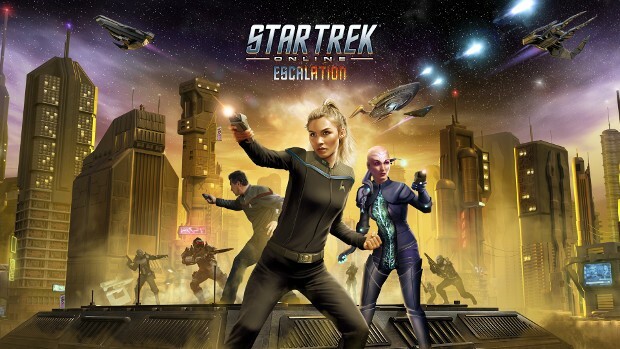 Star Trek Online Season 13 is available to play on console now.